Here is a (poorly scanned) colour slide of my mother. What interests me is not the punctum, not the essence of the subject, not my subjective or phenomenological positioning to the slide as an object, not mortality, and not the connoted or denoted meanings that may or may not exist within or outside of the frame. 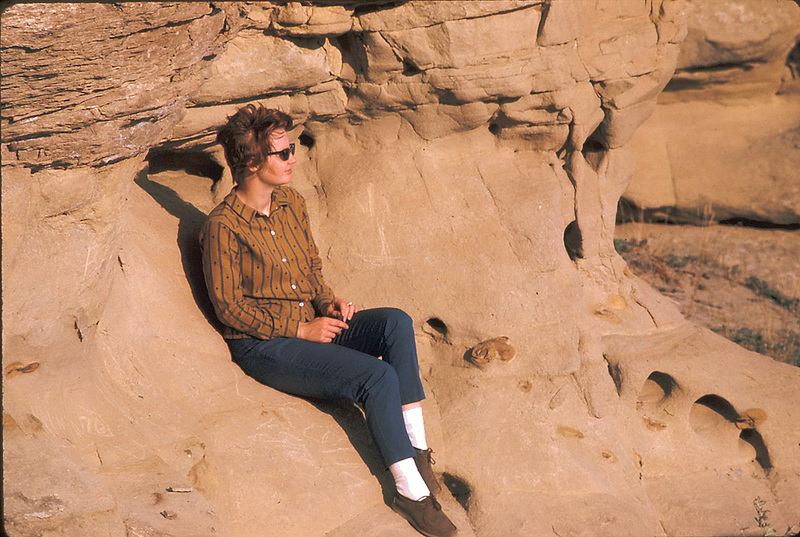 Mom at Writing-on-Stone Provincial Park, early 1970s. What interests me is the looking. My mother looking away from the camera, my father looking through the camera to capture the image. This looking is important because Dad didn’t take pictures of people. Flowers, mountains, sunsets, old buildings – we got tons of them. But people weren’t really worth wasting good Kodachrome film on. Taking people shots – that was more often Mom’s task. But on this occasion he does. On this trip to Writing-on-Stone Provincial Park, as part of an outing with the local Camera Club, Dad took time away from dramatic landscapes, petroglyphs, and hoodoo formations to steal a look through a viewfinder, and snap a picture. My parents have a vast slide collection, but it is also one that has been culled over the years. 18 slides of Writing-on-Stone survive – some of them even make into an article I wrote about amateur camera clubs. Only one – this one – actually includes a person within the frame. It probably shouldn’t have survived, since it’s not a very good photograph (c’mon dad – you cut off the edge of the shoe!). But clearly when it came time to organize and cull the slides, with a whole new round of looking, it still made the cut. The image must have meant something to my parents, beyond the aesthetic frame. I don’t see my mother in this image as much as I see a glimpse of the relationship between my mother and father / subject and photographer / looking away and look at. I was probably there, too, at Writing-on-Stone; only a few months old. But nobody took or kept any pictures of me – at least, not on this trip. I like the fact that the slide asserts my mother as individual, that it resists the temptation to always frame mother/child together (especially in those crazy first few months), and perhaps – just maybe – insists on a kind of intimacy of looking that only they share. A wonderful meditation on a slide, photographic theory, and the power of the punctum.